Author: Tori Vohland, Children in Transition High School Liaison and Jennifer Harris, Program Evaluator at the Washoe County School District. Please send any questions or ideas about this post to Tori at vvohland@washoeschools.net. In this post, we hope to inspire others working in PreK-12 educational settings to examine rates of chronic absenteeism among the students they serve. 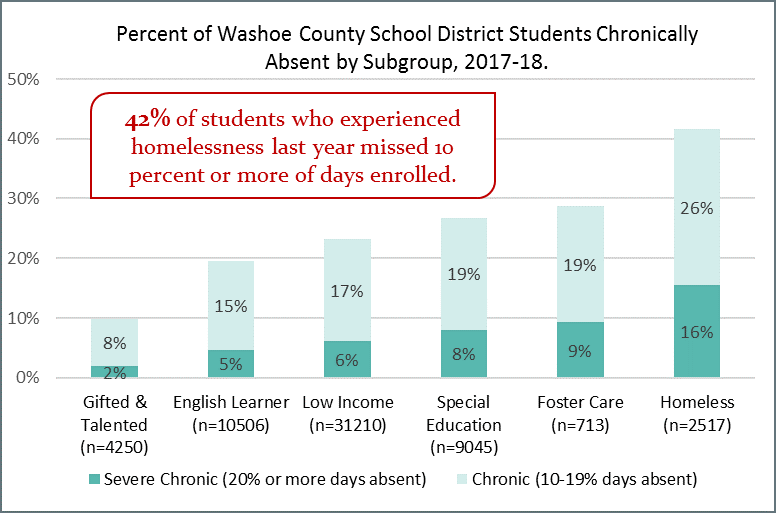 We define chronic absenteeism and share three graphic displays of chronic absence data from our school district, the Washoe County School District located in Reno, NV. School absenteeism is often the first and best indicator that a student may be at-risk for academic struggle. Students miss school for many reasons and frequent absence is often a symptom of underlying challenges. The Every Student Succeeds Act requires all states to report chronic absenteeism. This accountability requirement is an opportunity for those who support children and youth to highlight the impact of homelessness on the ability to attend school regularly. Students who miss 10 percent or more of days enrolled are defined as chronically absent. Chronic absenteeism considers both excused and unexcused absences, and can be used as a warning signal of homelessness. For example, children who experience homelessness are sick more often than their housed peers. Since absence due to illness is typically excused, the prompt for investigation of underlying challenges would not be triggered by examining unexcused absences alone. How can chronic absenteeism be described? Displaying data in simple graphs makes the information more usable. The three graphs shared here are examples of how we report chronic absenteeism data. We were inspired by examples provided by Attendance Works and we suggest visiting their website for additional examples. Example 1: The first graph illustrates the prevalence of chronic absence across student groups. It also displays the severity of chronic absence (i.e. chronic and severe chronic), which indicates different levels of support need. A call-out was added to bring attention specifically to students experiencing homelessness. Example 2. 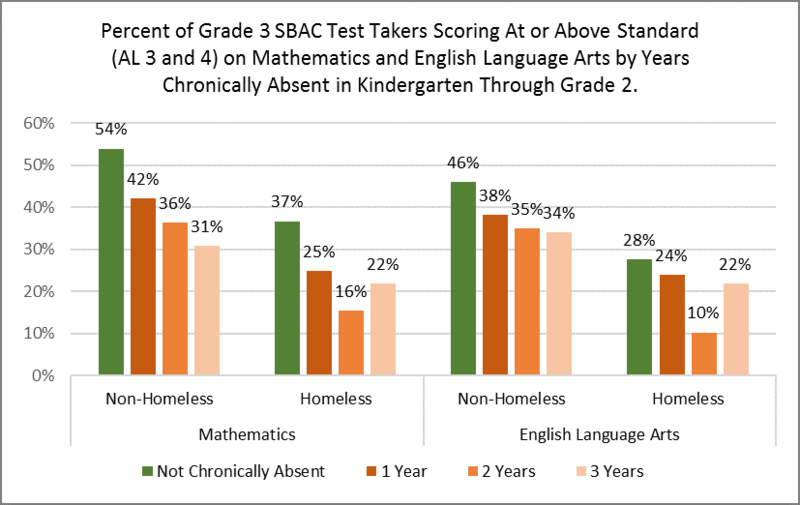 The second graph shows the relationship between number of years chronically absent in kindergarten through grade 2 and the percent proficient on the Smarter Balanced Assessment (SBAC) in mathematics and English Language Arts. For comparison, information is provided for students who experienced homelessness at least one of those years in school and for students who did not experience homelessness. Typically, the number of students in each category is also reported in corresponding tables. Example 3. The third graph shows the relationship between number of years chronically absent in high school to graduation status. 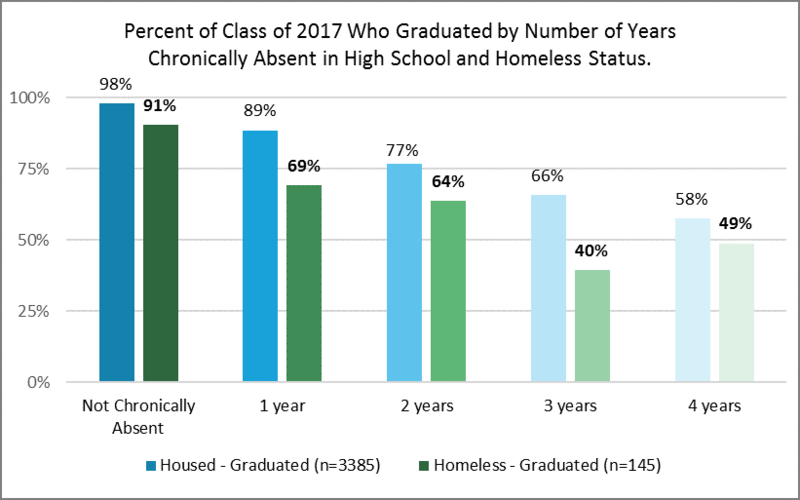 The influence of chronic absence and homelessness on the likelihood of graduating is visually apparent and is a powerful prompt for discussion around support for attendance. 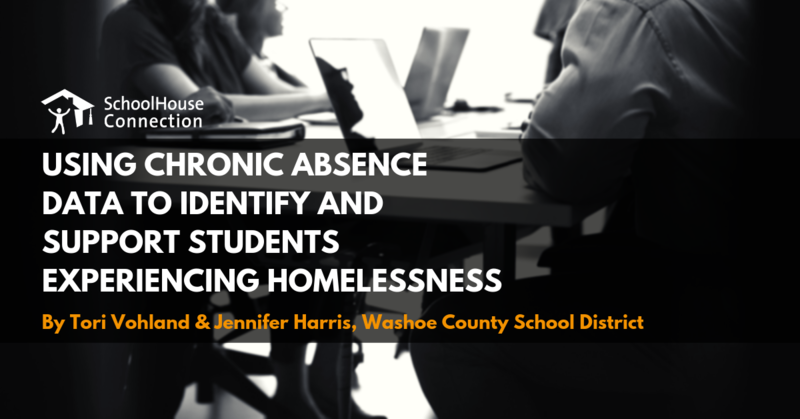 In this post, we hope to inspire others working in PreK-12 educational settings to think about how they might use absenteeism data to help identify students who are experiencing homelessness. Chronic absenteeism is a hot topic these days, and for good reason. When students consistently miss school, it is often a sign of underlying challenges and may signal a student is experiencing homelessness (see above for examples of chronic absenteeism graphs). Seeing the value of this information has led us to look more intentionally at how we can use available data to improve our work. Specifically, we ask: How can we use attendance data to find more students who are experiencing homelessness? Data visualization displays can be valuable tools for supporting data use. In our school district, we developed a data dashboard to display information in a simplified way. Our data dashboard shows information about student attendance and allows staff to quickly identify students who are consistently absent. Each element in these graphs is hyperlinked to student-level files that can be filtered by demographic characteristics and other information, such as homeless status. This information can be used by school staff to prompt questions about barriers to attendance and better positions staff to investigate whether students are homeless. Once attendance data is accessible, such as through a data visualization tool, a natural programmatic step is to refine how information is used. For our team, the potential to advance the way we identify students to receive McKinney-Vento support through improved data use is beckoning! Heeding the call, we are working toward increasing capacity among advocates in schools to monitor attendance among all students. Using data in this way could open doors to identifying students who are experiencing homelessness, but are flying under the radar. When we uncover the particular reasons why each student is not attending school regularly, we are able to identify more students who are experiencing homelessness. Let’s take a look at a possible process for how attendance data can help identify students who are experiencing homelessness: An assigned staff member, likely the primary person responsible for overseeing attendance, pulls a school wide report at the end of each week. He/she narrows it to students who have missed 10 percent or more of days enrolled (i.e. chronically absent). The names are filtered and sent out to the students’ assigned counselors. Next, counselors reach out to students and their families to see if there are any changes occurring at home and assess unmet needs. Once needs are determined, counselors then explore available resources (i.e. programs and services) to refer families to and also identify students as homeless when appropriate. Once students are eligible for McKinney-Vento services, liaisons can work towards addressing attendance barriers. Ultimately, poor attendance results in lower graduation rates, and students facing obstacles, such as homelessness, are at even greater risk. Our goal is to continue building on our procedures and strategies by utilizing group and individualized attendance data to monitor, detect, and provide support to increase overall student achievement and well-being. The process of how school staff responds varies by schools and systems, but mostly falls within the widely adopted Multi-Tiered System of Supports framework. This is also an important topic and deserves attention, but is not the focus of this post.